The fiery skipper is one of the smallest butterflies that you will see in your yard. This tiny butterfly has only a 1-inch to 1.25-inch wingspan. 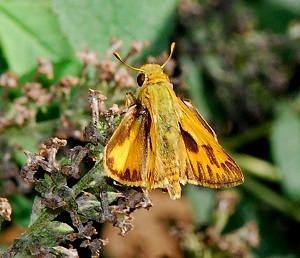 Males are yellowish orange. Females are much darker than the males. Females can be best described as being brownish orange. From above the border of this butterfly’s hind wings display a black border that features jagged tooth-like markings. From the side the wings are marked with numerous brown spots that remind me of freckles. 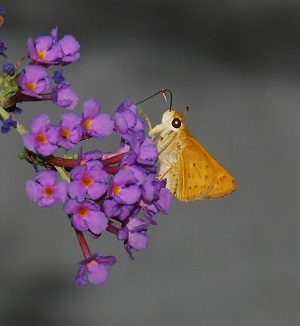 The fiery skipper can be seen flying in backyards throughout all of Georgia’s 159 counties. Multiple broods are produced each year, however, fiery skippers are most abundant during the summer months. Fiery skippers readily feed at a variety of flowers, especially composites. I have found that two of their favorite nectar plants are lantana and butterfly bush. A number of grasses serve as host plants for this butterfly. Some of these grasses, such as Bermuda, St. Augustine, and crab are commonly found in our backyards.